One of the many questions I regularly get asked when we are discussing aquarium projects with our clients is ‘what type of aquarium should I have – one with Tropical marine or freshwater fish?’ As this is such a popular question, we have produced a helpful article detailing all the pro’s and cons of each type below, as well as the aquarium ‘set up’. This is based on our experience of installing and maintaining hundreds of different tanks for our clients over the years. The first topic to cover is what exactly is the difference between the two types of aquarium fish. Well, this is quite simple. Although both types contain fish from tropical (warm) climates, the freshwater fish are from the rivers in these climates and so live in fresh (unsalted) water. Tropical marine fish are from the sea in these areas, and therefore live in saltwater. There are a few fish which are called ‘brackish water’, and these are from the water areas where the rivers flow into the sea, and so are used to a much lower salinity than proper marine fish. However a fish tank containing brackish water fish is less common, and so we have not included them for the purposes of this article. Within the two distinct varieties mentioned above, there are lots of different species of fish, and not all are compatible with each other. See our separate blog posts which go into more details about the species that are suitable for each type of aquarium, and what species are compatible with each other. Right, now for the pros and cons of each type of aquarium and fish. Firstly we will talk about tropical freshwater aquariums and the fish. Tropical freshwater Fish are generally less expensive to buy. The majority of tropical freshwater fish are captive bred in fish farms dedicated to the breeding and supply of these fish. Tropical freshwater fish require less complicated aquarium set-ups, and are generally easier to keep than their marine equivalents. You can house more tropical freshwater fish ‘per gallon’ than other types of fish. 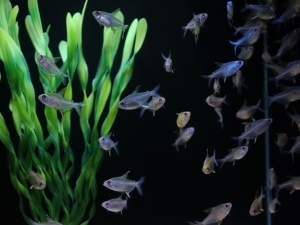 Tropical freshwater aquariums require less maintenance – generally once every 2 or 4 weeks (depending on the exact fish and location of the tank). Tropical freshwater fish are much easier to feed while you are holiday as they can be fed solely with automatic feeders. If you require a smaller tank, freshwater is the better route as there are a lot of smaller fish species than with tropical marine fish. Tropical freshwater fish are all different shapes and sizes. Tropical Freshwater fish are not as colourful as their saltwater counterparts – they tend to be more patterned with ‘subtle’ colouration. However they are still very colourful. The smaller tropical freshwater fish are generally not as long lived as marine fish. There are a few shrimps and crabs which you can keep with tropical fish, but these are often problematic in terms of what can be safely kept together. They are often not very brightly coloured. Now let’s take a look at tropical marine fish! Tropical marine fish are the most colourful and brightest of all fish types. Many have bold bright colouration, as if held by the tail and dipped in a pot of bright paint! Tropical marine aquariums can also house corals and other invertebrate life, also very colourful. Shrimps, Crabs, Tubeworms, Nudibranchs (sea slugs and the like) can all be kept with compatible marine fish. Tropical Marine Fish are all sorts of shapes and sizes. Tropical marine aquariums require a lot more equipment to keep everything happy and healthy. 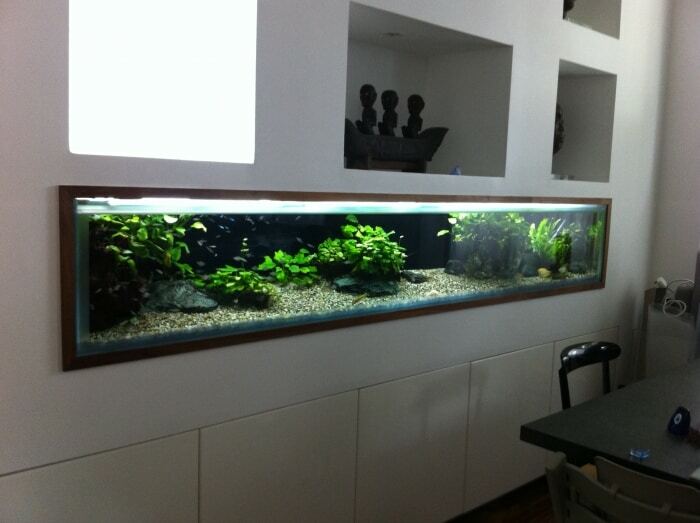 As such, they cost a lot more money to install than a similar sized freshwater aquarium. 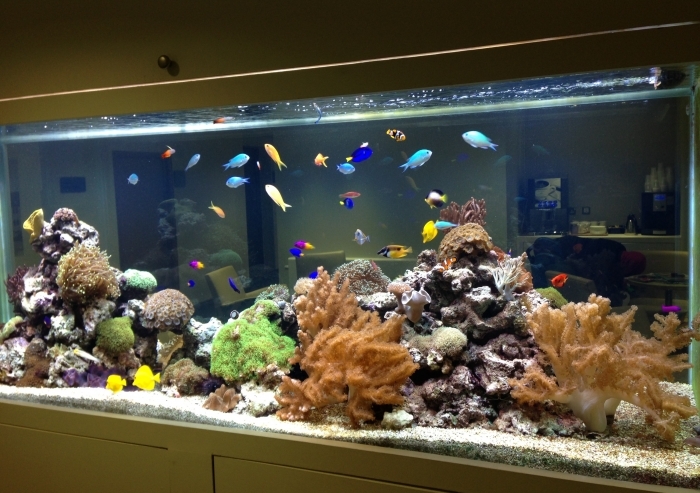 Tropical marine aquariums also require much more maintenance to keep them happy and healthy. We prefer to visit reef aquariums weekly to ensure we keep an eye on everything, and keep on top of all the maintenance tasks. The fish can be a lot more random in their behaviour – and even fish that are supposed to calm and friendly can differ from the normal! A lot of the fish are caught from the wild and imported, therefore they have a massive transition to get through to get to your tank. As such, there is a bigger risk of losing the fish to stress when keeping marine fish, as this transition can take months. Marine fish in larger reef tanks can be difficult to treat for disease, as many remedies cannot be used with corals. In this situation, the fish have to be removed from the reef tank for treatment, which in a larger tank can be nigh on impossible!! Feeding marine fish can often be more specialised, involving frozen foods which cannot be automatically fed. This requires more intervention than would be required with a tropical freshwater tank. Although there are good quality dried foods for marine fish available, there are still many fish as well as corals/invertebrates which will require frozen food. We hope that the above article has proved useful, and no doubt will contain information that will be helpful when deciding what type of aquarium to install. If you require any further information, or would like to ask questions on the differences, please do contact us and we will be happy to answer! !